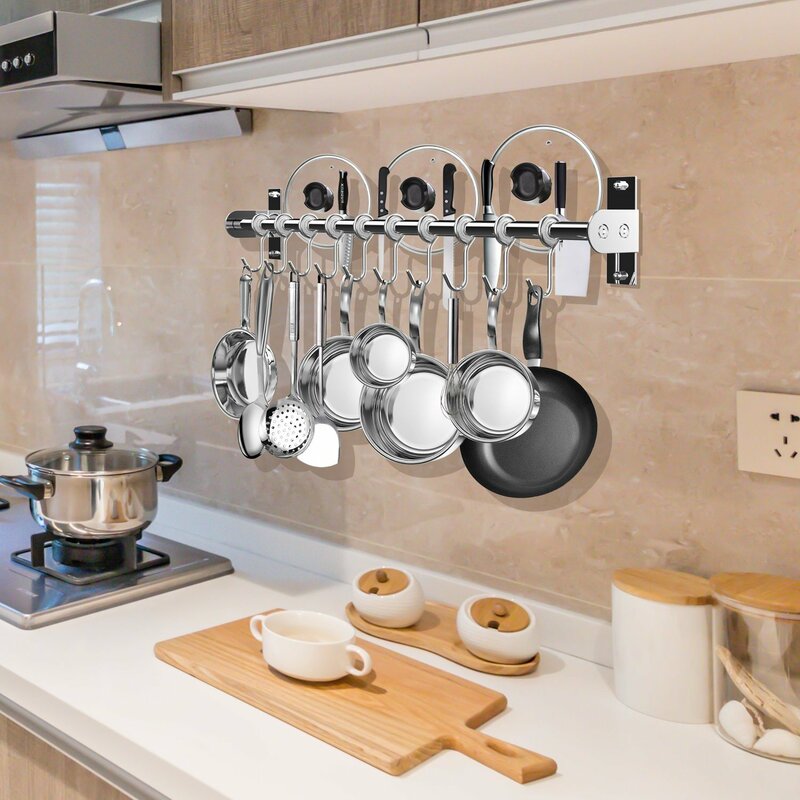 Here are some clever storage solutions if you want to know how to store pots and pans in cabinets, cupboards and with wall mounted racks. 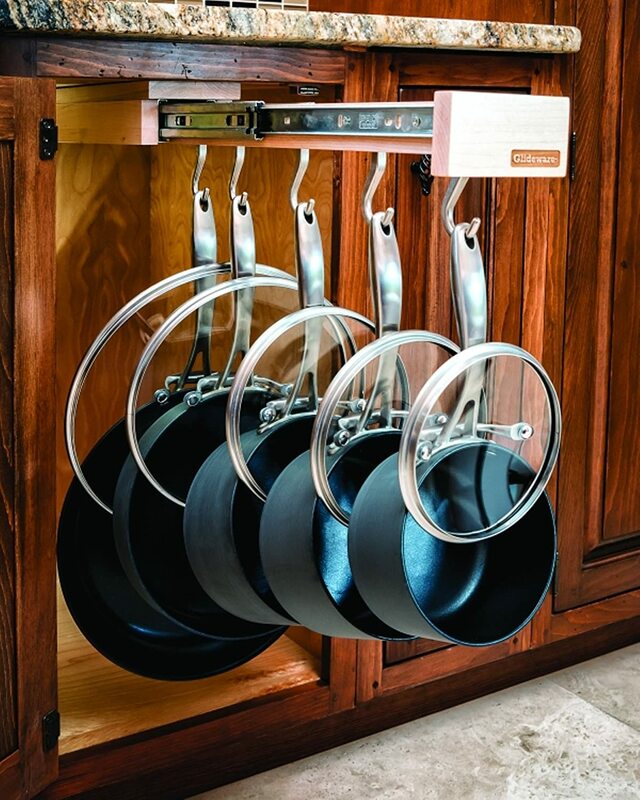 Here is a great idea for organizing pots and pans in a small kitchen. These rack shelving units will attach to the wall. 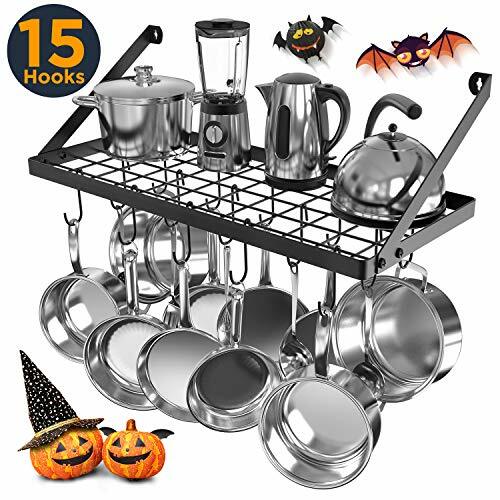 It would be possible to organize all your cookware on this rack as there is plenty of space for hooks to hang pots and pans by the handle, there is also a shelf that is useful for those items you can’t hang up. 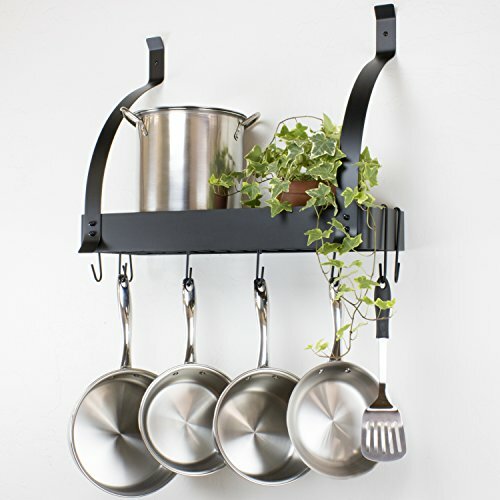 The hanging space can also be used for your kitchen utensils. Pot and pan lids can be a real pain to store and organize, they never stack on top of each other. 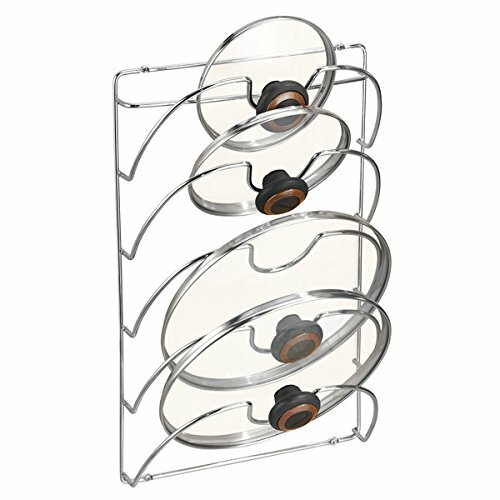 One solution to this problem is a rack for organizing your pan lids. This either hangs over the kitchen cabinet door or is attached directly to it. Either way, this is a genius storage idea for using a space that is often underutilized in the kitchen. 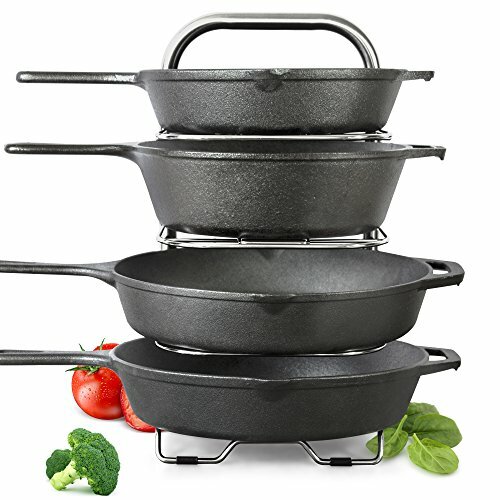 One of the challenges of organizing your cast iron cookware is dealing with the weighty items like large skillets and pans. So you will need to look out for organizing racks that can deal with the weight. 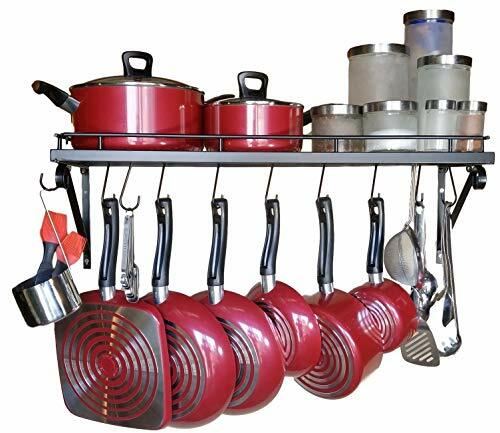 I love my cast iron cookware and I like to have it on display as it is so beautiful to look at, so a wall mounted rack is the one for me. 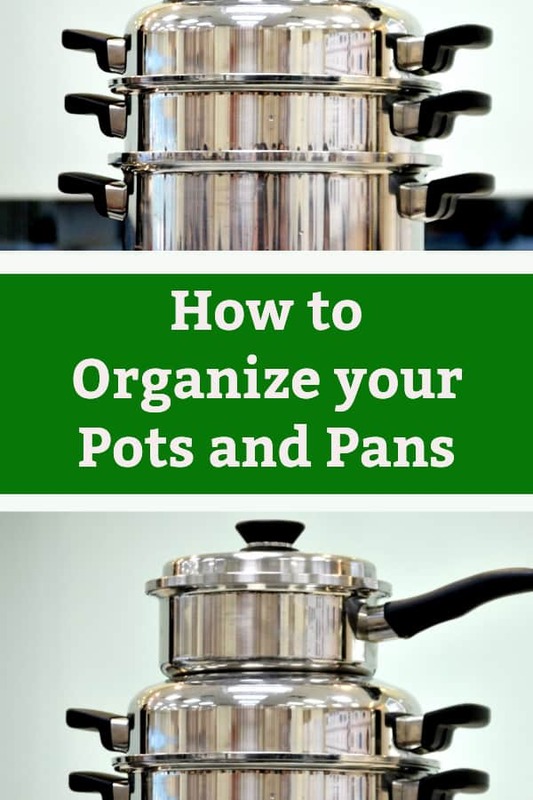 Great idea and solutions if you are want to know how to arrange pots and pans in the kitchen. 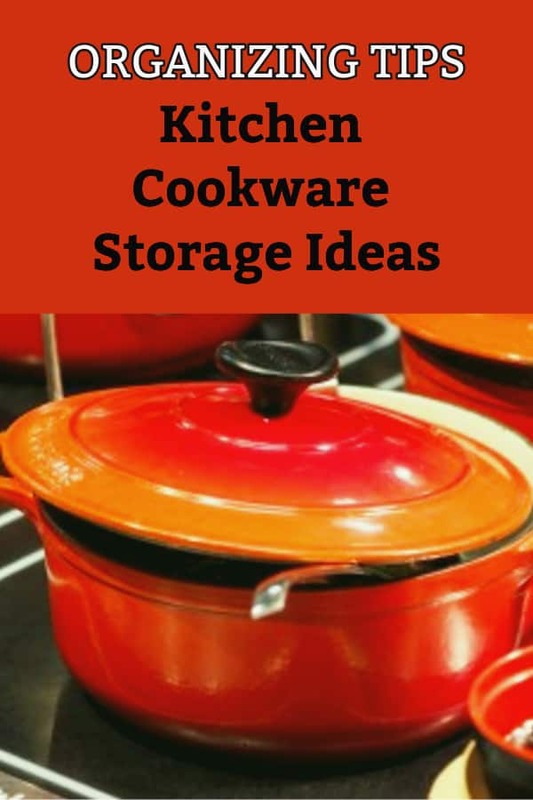 Storing all your cookware can be a challenge as these items can be big and bulky to organize. I love the idea of being able to organize pots and pans under the sink with shelving or alternatively, a clever pull-out hook system. 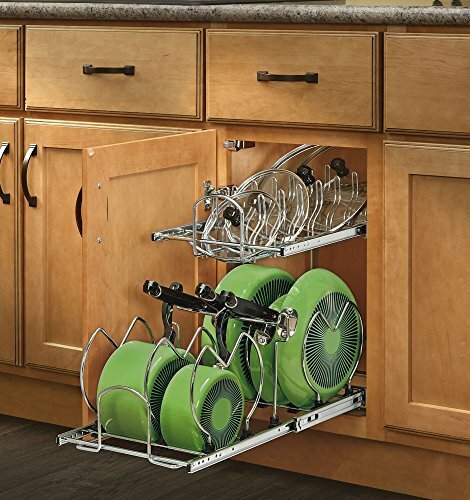 After decluttering your cabinet use one of these products to tidy up your cookware. 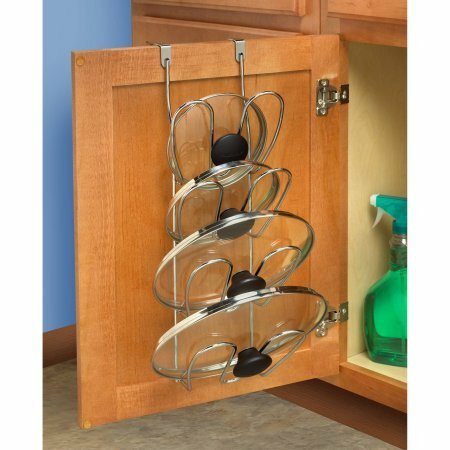 Great storage system if you often wonder how to store pans and cookware successfully in your cupboards. 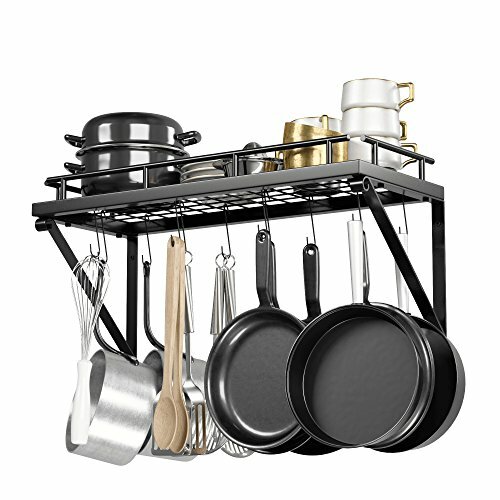 It is quite surprising how much cookware you can store if you can hang all your pots and saucepans vertically. I love that it will only takes a moment to pick and grab the pot or pan you want to use for cooking. Also if you have spent a lot of money on a new matching set of cookware it is a nice way to display it. This video teaches us how to store cookware. One of the best tips for organizing pots and is to use shelving unit and stacking racks. This means that your cookware does not no end up being heaped on top of each other. It is so nice to just be able to grab the pan you want without having to move other items that are stacked on top. When I moved house a couple of years ago I was shocked at how much cookware clutter I had accumulated in my kitchen cabinets. I was a great opportunity to get rid of those items that I never used. Life in the kitchen is much better with fewer cooking items cluttering up precious space. You don’t have to wait until you move house! You can follow a tidying and organizing tutorial like the Kon Marie one below and have all your kitchen organized forever.